5000 years of Recorded History. Let us understand the historical position of Islam in U. Kashmir a little more. Mahabharata epic is one of the two greatest epics of Hindus, and it describes a great war that took place around 3000 BC. In this epic there is a mention of Kashmir’s Kings, the contemporary King was Gonand II. Raj Tarangini is the authoritative history of Kashmir written by the famous author Kalhan. Names of various dynasties who ruled Kashmir then onwards is also available5; e.g. Sandiman, Sunder Sen, Nara etc. Emperor Ashok, who ruled from Afghanistan to the Eastern India, and south up to Deccan, established in 250 B.C. the capital of Kashmir ‘Shrinagari’, very near present day ‘Srinagar’. King Kanishka also ruled Kashmir along with major portions of India, during 1st century A.D. He organized a world conference on Buddhism, which has been reported later by the Chinese traveler Hien-Tsang who came in the seventh century A.D. During 724 – 761 A.D. Lalitaditya established another great empire like that of Ashok. He built the famous Martanda (Sun) Temple, ruins of which can still be seen. Ajaatapeeda ruled during 813 – 850 A.D., and the city Pompore famous for Saffron was founded,. Awantiwarman ruled during 855 – 883 A.D., and founded the city Awantipur. Shankarwarman ruled during 883 – 902 A.D., and founded ‘Shankarpura – Pattan’ (now known as Pattan). Chenghis Khan, the well known Mongol warrior during 13th century attacked Central Asia up to Iran, and thus created havoc in those areas because of his brutality. Thousands of Muslim refugees escaped to peaceful Kashmir, and the era of Islamic invasion began. Muslim invaders started attacking Kashmir one after another. In 1320, on the death of King Suhadeva, a Tibetan prince Rinchana, who was given a jaageer, (an area) to rule by the King, became the King by intrigue and sought conversion to Hinduism. When refused, in anger he got converted to Islam and ruled for three years. After his death in 1323, the Hindu Queen Kota Rani (wife of King Suhadeva; the fourth woman in Kashmir to become a Queen) ruled till 1338, when Shah Mir seized the power by defeating the Queen. Shah Mir, who had also been given a Jaageer by the King Suhadeva, established the first Muslim dynasty; and Islam spread quickly. In 1389, came even more brutal King Sikandar6 who was so ruthless that all Hindus either got converted or left Kashmir. But during the reign of his son Zain-ul-Abidin (1420 – 1470), who realized his father’s folly, became liberal, and many Hindu families returned. But after him, the persecution continued, sometimes very severe and at others somewhat liberal. According to a tradition, 24000 Brahmin families were converted by the power of sword during one of the proselytizing mission of one of such brutes viz. Mir Shams-ud-din Iraqi in 1492. The Mughal emperor Akbar in 1587 won Kashmir and then it remained with Mughals till 1752, when Afghans won it. Afghans were very inhuman in their proselytizing mission. There 67 years rule was the most tyrannical of all the Muslim rules. Hindu and Muslim are the same. She says that the Supreme One is present in every atom of this world. There is nothing without Him. Therefore Hindus and Muslims are the same as they all are pervaded by the same Supreme. If you want the supreme wisdom, then know who you are, know your Self, which is beyond this mind and body. Once you know your Self, then you will know the Supreme, for then you will realize that the Supreme is nothing else but the same as your Self. I saw the Supreme shining in everything. People saw that Sheikh-ul-Alam and Nur-ud-din were realized persons, and they had high reverence for them. They had both Hindus and Muslims as disciples. They were given the title of a ‘Rishi’ which means a sage of as high a status as those of Vedas, the ancient Hindu scriptures. And thus started the ‘Islamic Rishi’ tradition in Kashmir. The well known poets who followed in this Rishi tradition are Mali, Habba Khatun (16th century), Rupas Bhawani (1621- 1721), Arnimal (d.1800), Mahmud Gami (1765 – 1855), Rasul Mir (d. 1870), Paramaanand (1791 – 1864), Ghulam Ahmad Mahjur (1885 – 1952), Abdul Ahad Aazaad (1903 – 1948), and Zindaa Kaul (1884 – 1965) etc. The Rishi tradition, despite persecution by Muslim rulers, was followed by Kashmiris for 500 years. Now the intolerance of Sunni-ism is being spread with the weapon of terrorism. Though feeble and mute, Rishi tradition is still surviving now, but is under grave danger of extinction. However it may revive if the terrorism is stopped soon enough. Genocide, though of a different kind, is going on in Kashmir. In 1819 Ranjit Singh, the Sikh ruler, won Kashmir from Afghans and appointed Gulaab Singh, the Dogra ruler of Jammu as his representative for Kashmir. Gulaab Singh won Ladaakh, Baltistan etc and by mid nineteenth century enlarged his Kingdom to that of the pre-partition days (U. Kashmir). British defeated the Sikhs in 1845. In a treaty signed in 1846, the British recognized Gulab Singh as the independent ruler of Jammu and Kashmir. Gulaab Singh had to accept their ‘paramountcy’ and had to pay them 7.5 million rupees (probably annually), for his recognition as the Ruler. 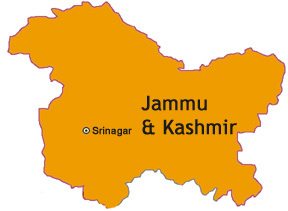 That boundary is the boundary of undivided J&K. During the British rule, U. Kashmir was ruled by Gulaab Singh like any other princely state those days. On independence of India, a group of Muslims, under the leadership of Jinnah, with British support, got Pakistan carved out of India. On 15th August 1947, in the British ruled portion of India, Muslim majority areas with contiguity with each other went to Pakistan. The rulers of erstwhile States had to choose between India and Pakistan, subject to contiguity, or independence. All the states chose to join India or Pakistan but not Hari Singh, the then ruler of U. Kashmir. He had full faith on his very small and mostly Muslim army. He obviously was totally out of touch with reality when he dreamt about remaining independent. When he delayed his decision, Pakistan first stopped the route for essential supplies to U. Kashmir, for then main supply routes were in their areas. This was the first violation of the ‘Agreement’ on ‘Partition’ by Pakistan. Then on 22nd October 1947 came the second violation, a disastrous one, which shattered Hari Singh’s dream when a large number of tribals armed and supported by Pakistan Army attacked U. Kashmir. The impractical Maharaja Hari Singh even then delayed his choice, and signed the stipulated, and now famous, ‘Instrument of Accession’ only when the invaders reached close to Srinagar, on 26th October. This signing of the Instrument was supported by Sheikh Abdullah, the leader of the people of Kashmir. The Governor General of India, Lord Mount Batten accepted the ‘Instrument of Accession’, thus making it legally binding. It is only then that the Indian Forces entered U. Kashmir and, firstly, saved Srinagar and then started driving the invaders back. The Indian Forces got total support of the local people, without which they could not have defended because only a small army could be taken to the airport of Srinagar by air in such a short time, as no proper land route was then existing between J&K and (newly divided) India. The earlier route had been through Lahore which with hair-line-thin majority of Muslim population had gone to Pakistan. This History which you have written I think is not a work of a qualified and educated man.I think that you are not fully aware about the History of Kahmir and the History of ISLAM and Muslim period in kashmir.Islam with its civilization not by force not only changed the faith of Kashmiris but also their way of life and thinking.Kashmiris learnt self-belief,self-respect and consciousness. Traditions say that the King of Kashmir who was a Buddhist Rinchan Shah was walking down the Jhelum when he found Bulbul Shah praying by the Jhelum. He was startled by this act of worship and started seeking more information about this new faith. Later on after discussions with Bulbul Shah and his minister Shah Mir, he embraced Islam. Becoming Sultan Saddrudin Shah – the first Muslim ruler of Kashmir. There are ample proofs which depict that the Sufis from central Asia and Persia played a remarkable role to the conversion of Islam in valley. In year 1384, a well organized Islamic mission under the leader ship of Mir Syed Ali Hmadani arrived in Kashmir. Accompanied by about seven hundred followers a majority of whom were great religious divines, the Kubravi saint launched the vigorous movement of Islamizing Kashmir. The emphasis on the Islamization of royal family and the court as a pre-requisite for Islamizing people was an important modus operandi adopted by Syed Ali and his deciples. In this regard the role played by Shaikh Noor-ud-Din in converting the Kashmir into the Islamic fold is appreciable. He is said to have attempted the reconciliation of Hindu-Muslim practices and actually paved the way for the gradual assimilation of commoners to the Islamic identity. He condemned the caste system of the Hindus which tempted the low caste Hindus to accept Islam so as to be free from the clutches of Brahmans. Shaikh Noor-ud-Din Wali, the Patron Saint of Kashmir, is credited with the fact that the prominent Hindu ascetics along with their followers came under the fold of Islam. It seems probable that caste system among the Hindus must have prompted the low castes and the weaker sections of Kashmiri society to break off their religious ties with a caste – ridden social structure. The lower caste Hindu was attracted to Islam as a result of dialogue between the Hindu ascetics and Shaikh Noor-u-Din. In this connection the mention may be made that Bhum Sadhu, Tuli Raina, Ladi Raina and Hindu ascetics who entered the fold of Islam along with their followers. Reportedly twelve hundred Hindus under the leadership of Tuli Raina accepted Islam due to the efforts of Shaikh Noor-u-din.